A very enthusiastic Kent team travelled to Burgess Hill at the end of February for the Sportshall Regional Final against six other counties. Although they came last in their group the U/13 boys actually had higher places than any of the other Kent age groups. As there was still no sponsorship only team medals were presented, so the county decided to award their own medals to anyone who finished in the first three in their event. Thomas Keaveney from Ashford claimed a GOLD medal in the Speed Bounce with 89 bounces. Max Merrien (Bexley AC) bounced his way into Silver Medal position with 87 bounces. Jack Seery was the other medal winner wining Bronze in the Standing Triple Jump with 6.73m. Aston Fredericks (Thanet AC) just missed out on a medal coming 4th in the Standing Long Jump 2.18m.Connor Neal (Thanet AC) claimed two 5th places in his 4 lap heat he ran (53.5s) in the Final his time was (56.9s). His heat time would possibly have taken him into 3rd in the final. He jumped 6.72m in the Standing Long Jump just 1 cm behind Jack. Christopher Scrivens was very disappointed in his shot coming 5th with 6.72m some 3 metres below his best. Alex Bailey ( Bexley AC) covered an extra event as Harry Stafford ( Folkestone AC) was ill. The rest of the team were Gene Sanger (Folkestone AC), George Seery (Thanet AC) and Inigo Warren ( Invicta East Kent ). The only medal won in the U/13 girls team was by Catlin Gallagher ( Folkestone AC) in the Speedbounce with 82 bounces where she came 3rd. Mia Hillyard (Thant AC) finished 4th after an excellent run in the 6 lap time trial; (1m29.3s).Ashley Ward (Ashford AC )came 5th the Shot Putt with 8.29m just 60cm from 3rd place. Erin Moses (Thanet AC) missed out on 3rd place by 1 cm in the Vertical jump : the 2rd and 4th places both had 56. Zia Brathwaite (Folkestone AC) who stepped into the team when someone else dropped out came 5th in the same event 3 cm behind Erin. The rest of the team was made up of Chloe Birtwhistle (Folkestone AC), Diamilla Nkereuwem ( Invicta East Kent), Layla Holness (Invicta East Kent), Carys Shipton ( Thanet), Sam Hockey ( Paddock AC) and Lauren Macey (Invicta East Kent). The team finished 6th. Due to someone dropping out from the team just 2 days before the competition. meant that the U/15 boys team started out the day with only 6 athletes. Jack Smith (Bexley AC) took on the extra events). Unfortunately Jack was playing Rugby in the morning in Beckenham and was due to arrive in time for his race, due to unseen events he missed it by 10 minutes, so was unable to do the extra events, just the Paarlauf, which he did with Harry Pitman ( Ashford AC) they came 6th (1m 47.2s). Moses Areggbesola (Bexley AC) won a Silver Medal in the Standing Triple Jump 8.11m; 14 cm behind the winner. Moses came 4th in the 2 Lap race (22.9s). Another Medal winner was Jason Okusanya (Bexley AC) who came 3rd behind Moses with 8.04m. James O’Gorman (Paddock Wood AC) and Reece Williams ( Swale Combined AC)made up the rest of the team, which despite being one person short came 6th. Moses and Jason finished equal 8th in the all-rounder competition out of 40 taking part. Faith Etokowo ( Ashford AC) was the only medal winner in the U/15 girls. She won a Bronze in the Vertical Jump with 65cm. Alice English (Swale Combined ) was 8th in the same event with 60. Despite throwing over 8m in the Shot putt Alice could only finish 10th. Faith Cox (Ashford AC)jumped 79 in the Speed bounce to finish 9th .Natasha Scott (Medway & Maidstone) jumped 2.16m in the Standing Long Jump, unfortunately the girls do not do Triple Jump which Natasha prefers. Ella Hindle ( Ashford AC) Catlin Mellor( Invicta East Kent ) and Asha Root ( Tonbridge AC) who completed the team which came 5th . Alice English finished the highest in the all-rounder competition coming 14th out of 43 girls taking part. Full results are on the www.sportshall.org/resultsfixtures website. We would like to thank all parents and coaches for their support over the season .Plus Andrew Scones, Brian Charlton and Mick Duffin who came to officiate on the day. 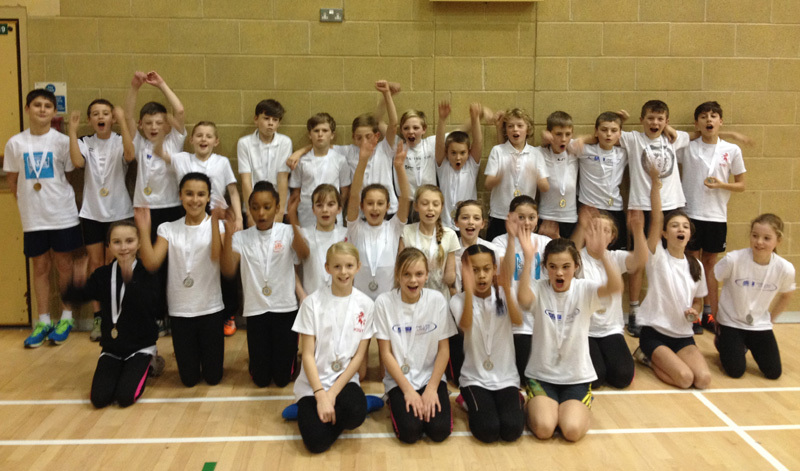 Kent U11 Sportshall athletics at the South East Regional Fun in Athletics at Burgess Hill, Sunday, 11 January 2015. The Kent U11 Sportshall athletics teams travelled to Burgess Hill in Sussex on Sunday 11th January to compete in the Fun in Athletics South East Regional Festival against 8 other counties from across the South East region. The boys and girls teams both produced an outstanding series of performances to finish the competition in the medal positions. The boys team were crowned Champions and the girl’s team finished runners up to Surry in a highly competitive completion. The competition got underway with the obstacle relays and the Kent sides started the afternoon in a winning position with both teams winning their respective races. The girl’s team notched up four overall team victories in the Obstacle Relay, 1 + 1 Lap Relay, Chest Push and Standing Long Jump. Three athletes recorded individual event victories; Emily Frimpong in the Chest Push, Sarris Teal in the Standing Long Jump and Molly Drew in the Target Throw. The boy’s team notched up three overall team victories in the Obstacle Relay, Over and Under Relay and the Balance Test. Two athletes won their individual events Ethan Smith was equal first in the Balance Test and Frankie Andrew won both his events the Balance Test and Javelin. The Kent teams were managed by Ashford Leisure Trust on behalf of the Kent County Athletic Association and were selected following their performances in the Kent U11 Sportshall Athletics Decathlon and the KCAA Sportshall Athletics Championships both held at the Stour Centre during November/December. The teams included the following young athletes.